Visit a traditional Bedouin village, taste Bedouin tea & tour around the tents. 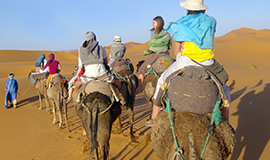 Go on camel rides & quad runners, also watch the sunset from top of the mountain. Later in the evening, enjoy Bedouin dinner party & stars gaze in the sky. Less than 16 years of age not allowed on quad.